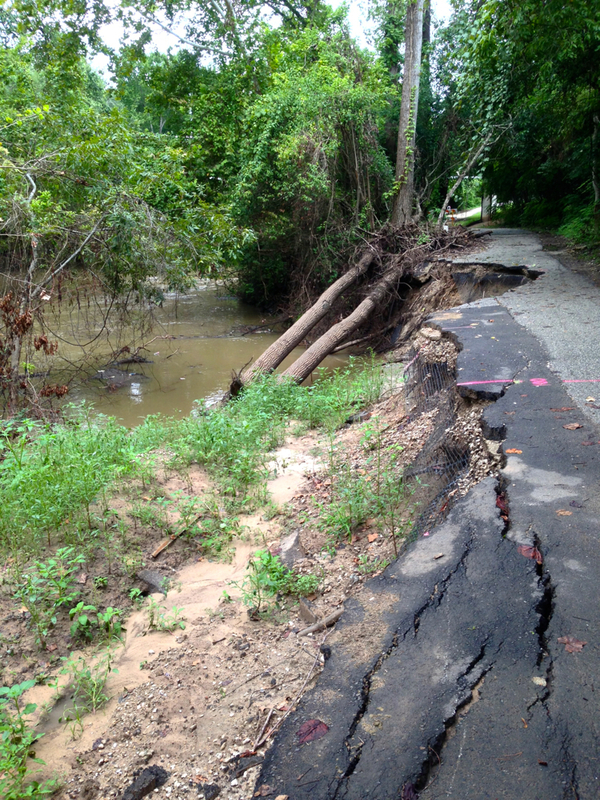 Fallen trees and eroded path on north bank of Buffalo Bayou before repairs began. Note darker patch of asphalt indicating trail had been repaired previously. Fallen trees should have been left in place against the bank to collect sediment and rebuild the bank naturally and for free. Note riparian plants already stabilizing the sediment. Photo taken August 19, 2016. What Was Wrong With This Scene and Why Was It Happening? 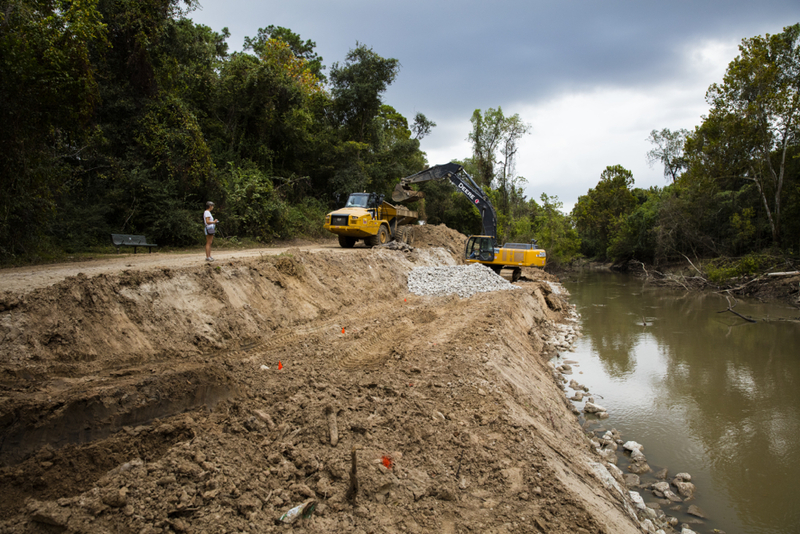 The heavy equipment was at work in Terry Hershey Park in far west Houston, where contractors hired by the Harris County Flood Control District were making what were described as “emergency repairs” to the north bank of the bayou. Flooding and extended high waters released from the dams last spring had eaten away at the bank and the asphalt path built on the water’s edge. The district has identified at least a dozen sites to be repaired between Dairy Ashford Road and Beltway 8. But everything they were doing was among the more environmentally damaging, expensive, and outdated practices possible—short of actually lining the bayou with concrete—and also likely will end up needing to be done all over again. And if you don’t care about the biological health of our bayous and streams, or about the cleanliness of the water flowing through them, past our houses and parks and into the bay, or about erosion and flooding downstream, you might care about your tax dollars being flushed down the river. And yes, in addition to clean water and common sense, we are concerned about flooding upstream and downstream and the predicament we have with the dams that drain into the bayou here. But note that this repair project is not about increasing the flow in the bayou or fixing flooding. (It may increase flooding. See below.) It’s about putting the banks and sidewalks back where the bayou doesn’t want them to be and trying to make them stay there. We have to ask why. There are cheaper and more sensible courses of action. Terry Hershey Park is a popular 500-acre linear park with hike and bike trails, both paved and natural, stretching for about six miles along Buffalo Bayou in West Houston between Barker Dam (Highway 6) and Beltway 8 (Sam Houston Tollway), and along a tributary draining Addicks Dam south of Interstate 10. The bayou here was once a forested, meandering stream. More than half of the bayou along this stretch was stripped, dredged, and straightened by the US Army Corps of Engineers in the early 1940s to serve as a drainage channel for the federal dams then under construction. There are still oxbow lakes in the area that were once part of the slow-moving, winding river. In the 1950s much of the rest was stripped and channelized, and plans were developed to line the channelized bayou in concrete all the way downstream to Shepherd Drive. That project was eventually stopped in the 1960s by a popular movement of concerned Houstonians, including Terry Hershey, George Mitchell, then US Rep. George H.W. Bush, and a great many others, whose concern proved to be far-sighted. Stripping, straightening, and hardening the banks of streams is no longer accepted practice for flood control. More recently homeowners on the south bank of the bayou have been successful in persuading the city not to raze forest for detention on the bayou. (Detention, now considered the first line of defense against flooding, is temporarily detaining or slowing stormwater so that all the water doesn’t rush into storm drains, pipes, streets, and streams all at once, overwhelming the system. Detention can be anything from angled gutter pipes to porous driveways, swales and rain gardens to tall grass, trees, prairies, wetlands, and large ponds.) The flood control district also has promoted plans to cut trees in the park for detention. Members of Save Our Forest urge the city and county to seek regional alternatives for detaining storm water. Shortly after the concrete project was dropped in the 1960s, the federal government sold the 500 acres that are now the park to the flood control district, and in the following decades the district left the stripped, straightened bayou to revert to a more natural state. Trees and plants grew back. In the 1990s the district entered into an agreement to lease the land to Harris County. Dirt paths were paved with concrete and asphalt. The county created Terry Hershey Park, now managed and maintained by Harris County Precinct 3. But the bayou, growing stronger with increasing rains and higher flows from development upstream, continues to seek out its historic meanders. And our research shows that the historic meanders are where the banks and sidewalks have repeatedly failed. Geologist Tom Helm has done the research connecting the meanders and the bank erosion. Watch this brief slide show created by Helm showing the historic meanders and the geologic fault lines that caused the river to wind in a section of Buffalo Bayou between N. Wilcrest and Beltway 8. The slideshow also includes for comparison a map of the disturbed areas being repaired in the area. 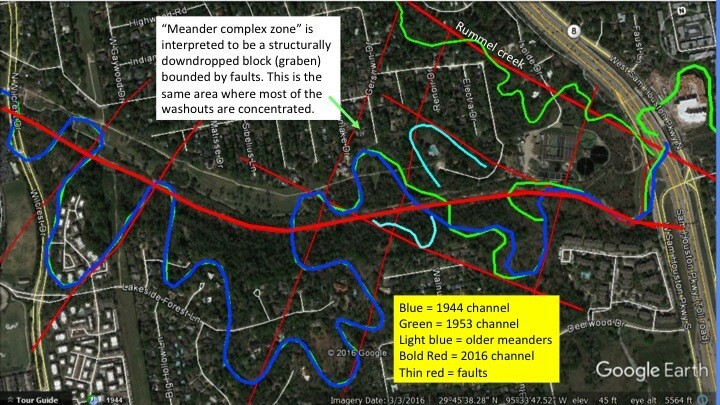 Compare sites being repaired by Harris County Flood Control with locations of historic meanders. Image by HCFCD. Enlargement of area bounded in red in previous slide, with N. Wilcrest on far left. Image and text created by Tom Helm. 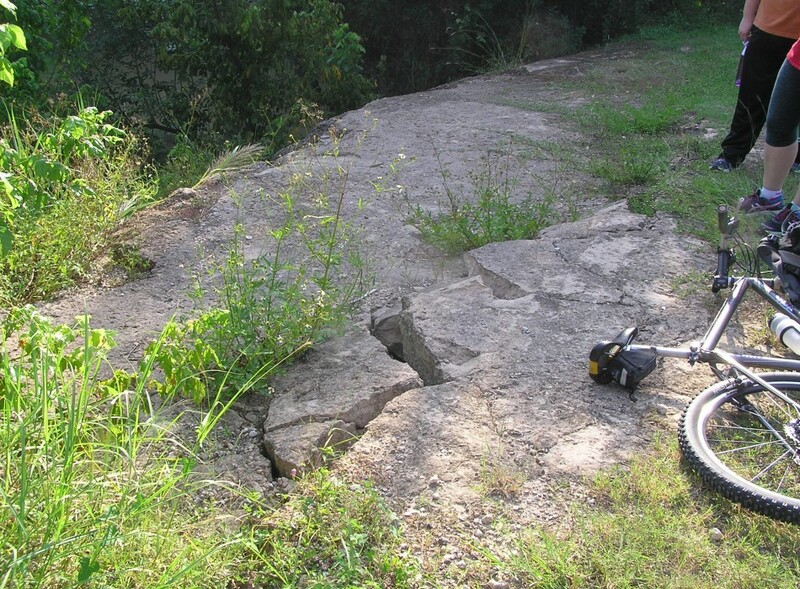 And here is a slide show of photographs taken by Helm of other disturbed areas of the north bank of Buffalo Bayou scheduled for repair. The photos show evidence of repeated repairs of the sidewalk along the bank in the form of patched cracks and darker colored sections of the path. This photo by Helm shows a second level of asphalt exposed by the collapse, also indicating the path had been previously repaired. This is Washout #10 along what was once a meander. “They’re trying to fix a problem that’s not fixable,” says Helm. However, the flood control district’s overall policy and practice here is to immobilize the banks of the bayou, in this case with limestone rock (a material foreign to the bayou), and to make the banks smooth by removing the riparian vegetation so vital for cleansing the water and protecting against erosion. Flood control’s goal is to move stormwater down the river as fast as possible, a goal that unfortunately often only causes more erosion and flooding downstream, as fast moving waters meet obstacles and bottlenecks, including, for instance, bridges. Other expensive, wasteful, and outdated flood control district practices: widening and deepening channels, mowing the grass on the banks, cutting trees for detention ponds. But those important issues are for another story. Why Is Everything They Are Doing Wrong? 1. Driving heavy equipment on the bank compacts and kills the soil, making it less porous, less permeable, less nutritious for vegetation, less stable and more likely to erode, and also kills all the beneficial creatures small and large living and working under there. It’s all part of the system. Everything is connected. 2. Digging up or excavating the riverbank destroys the structure of the soil and kills the healthy bacteria or biome, neutralizing its amazing pollution-fighting powers and turning it into useless dirt. Also see above. 3. There has been no attempt to restore the healthy bacteria or microbes to the excavated dirt, and according to the district, there is no plan to do that. The soil and sand excavated from the banks in the park was being stored in large piles somewhat discreetly dumped behind some trees. It was then returned via the big dump trucks to the bayou and spread by the tank-like excavator on top of the limestone riprap and pounded into place. 4. Trees and vegetation on the banks, so important for erosion control, slowing and filtering stormwater and runoff, were removed to provide access for the heavy equipment. The district says the rock and compacted soil will be planted eventually with turf and other vegetation. 5. The repairs are ugly and unnatural. 7. The asphalt path is too close to the river’s edge in places anyway. Sidewalks constructed too close damage the banks and tend to get washed away, requiring costly repairs. Impermeable pathways also increase runoff and erosion. There is plenty of room to move the path slightly out of the way and still have a lovely view and experience of the bayou. Greg Wyatt, Harris County Precinct 3 maintenance manager for Bear Creek and Terry Hershey parks, said in a recent phone conversation that the asphalt trail would be put back “exactly where it was prior to the damage.” But he also said there had been “consideration” and a “possibility” that some parts of the asphalt trail might be moved out of harm’s way. 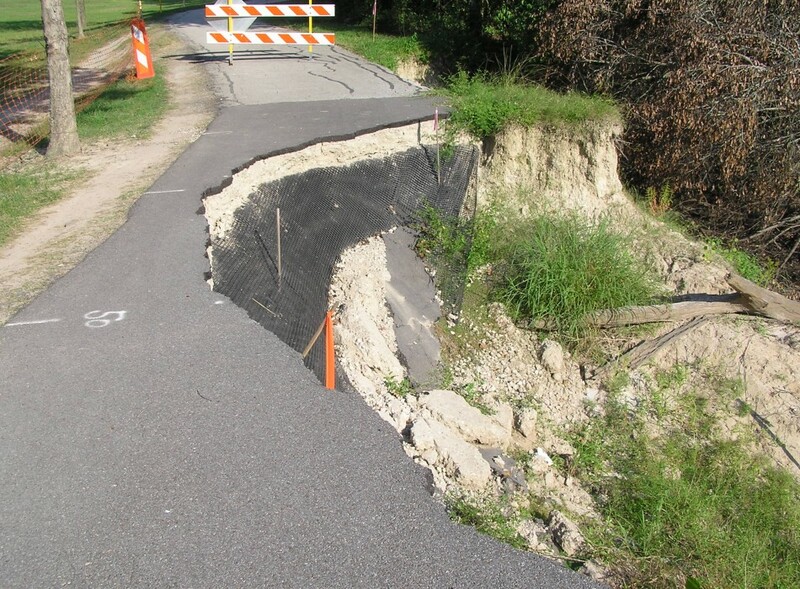 The repairs began in late September and so far mostly have been focused on five priority sites near Wilcrest in the park. There are still other sites to be repaired in the park and across the county. 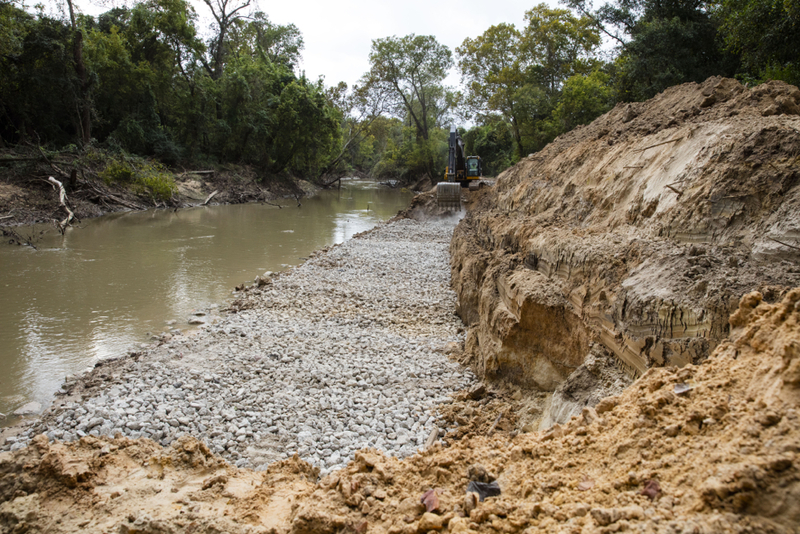 According to a report in the Houston Chronicle, the flood control district has identified almost 2,000 locations on the banks of county streams that need repairs as a result of the floods in 2015-2016. 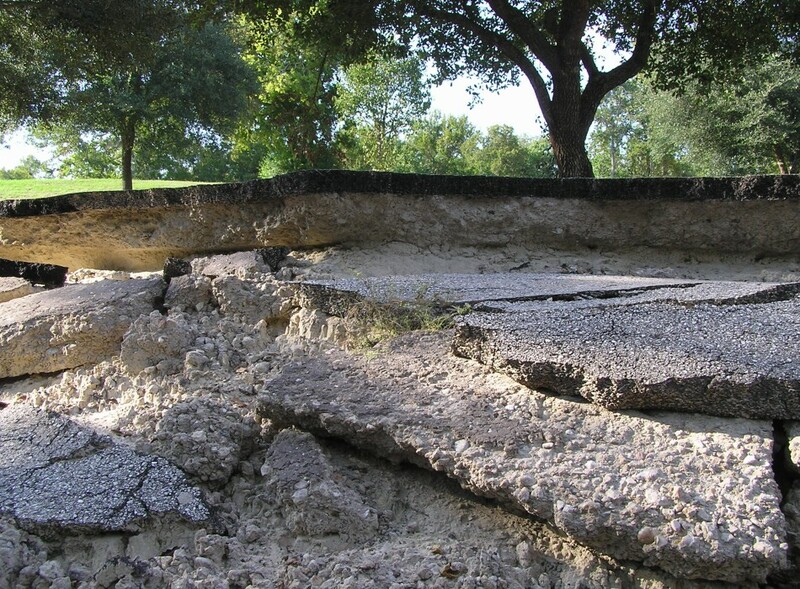 The initial estimate for repairing the banks in Terry Hershey Park was $600,000, as reported by the Chronicle. The contractors for the work are Freese and Nichols, an architecture and engineering firm, and Serco, the construction company. But a spokesperson for the district said in a recent email that the disturbance to the bank was more extensive than originally thought. Park manager Wyatt said that more damage was discovered when vegetation was removed from the banks to make way for the heavy equipment. New cost projections are still being developed. And apparently that initial $600,000 cost estimate does not yet include the cost of replacing the asphalt trails. Let’s see. Using just the initial estimate of $600,000 for 12 sites, multiply by 166 (2,000 countywide sites divided by 12), that comes to a potential cost to county taxpayers of $100 million to repair county streams using the methods being used in Hershey Park. That figure doesn’t include the lost economic value of riparian corridors for treating water. The flood control district received a blanket regional general permit in 2013 from the Galveston District of the US Army Corps of Engineers to do essentially whatever it thinks it needs to do anywhere. That permit apparently covers digging up and rebuilding these bayou banks, which are essentially wetlands, performing the same vital function as wetlands, and should be protected as wetlands. The Corps is responsible for enforcing the Clean Water Act, the federal law passed to protect the health of our waters. “Especially since there is no infrastructure imminently threatened, it would be very hard/impossible to get away with this in the San Francisco Bay region nowadays,” Mathias Kondolf, professor of environmental planning at the University of California, Berkeley, wrote in an email. Could the flood control district have chosen a better, more effective, more practical, less costly and less damaging response to the changes in the banks in Terry Hershey Park? We think so, and so does FEMA. The best response in this case would have been—perhaps still could be—to move out of the way. A few picks and shovels to pick up the damaged asphalt. Leave the fallen trees and brush in place on the banks to collect sediment and rebuild. Let the river restore its edges naturally over time; seek out its meanders if necessary. It’s going to do that anyway. Watch this beautiful film called Letting the River Heal that explains the benefits of doing just that. Where necessary, new asphalt paths could be built higher up the banks, or merged with the paved trails already in place in those higher locations. Nobody has to sacrifice access to or appreciation of the bayou. We are not advocating letting the bayou meander all the way through people’s houses or through subdivisions, although it’s possible that there are still sections of the bayou here secretly meandering underground through neighborhoods, via culverts. A representative of the flood control district mentioned that at a neighborhood meeting earlier this fall. As an alternative method of stopping erosion, FEMA recommends brush mattresses, which are essentially constructed versions of the natural process described above. Here is some advice about brush mattresses as well as other softer, more natural, and cheaper methods of erosion control on rivers from our neighbors up East. Did the flood control district consider alternatives before embarking on the current repair program in Terry Hershey Park? 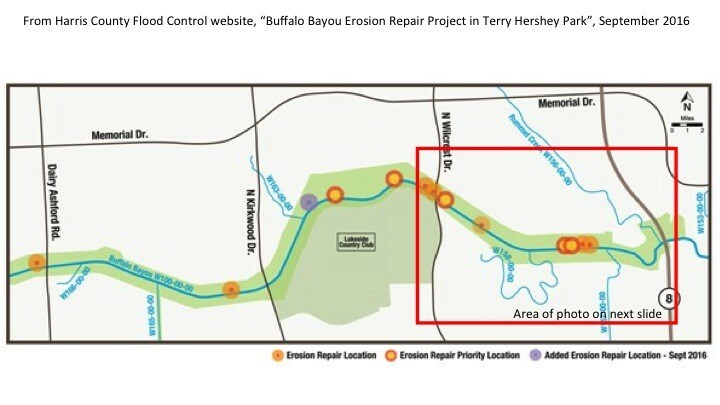 “The repair methods that we are using are time tested, reliable and appropriate for existing conditions along Buffalo Bayou” was the written response from the district. “We have a history of thinking we have the engineering expertise to redesign rivers to be more efficient or to be fixed. Over the long run, we don’t.” — Floodplain Management, A New Approach for a New Era, p. 141. There’s got to be a balance. Yes, please let the “river heal”. Surely the “nature as entertainment” folks will understand. Informative signs to educate bikers, walkers, joggers and birders could help the cause. What can we as citizens do next? Thank you for the informative article. Informative signs as the river heals is an excellent suggestion. More education about these issues is important. Our bike trails downtown are impacted by powerful waters and floods..I see a lot of damage..same thing out West. The improvements should be tucked back up in the woods and open up now and then to views of the river at places where the soils are making new sandbars. The bayou should be worked on by hand crews to remove non natural materials. The bayou…if left alone and allowed to take back the role of natural river..and only when the dam is repaired to hold enough water..to allow for slow release .. could that happen. Rapid draw down of waters placed in the stream and shut down quickly is a large cause of erosion. It would be cheaper to give away the money. I quite agree with what Deborah Lancaster said on the matter. The corporations have reduced many of us to slave wages. Come up with other ways The (financially crippled) People can help make the situation right. 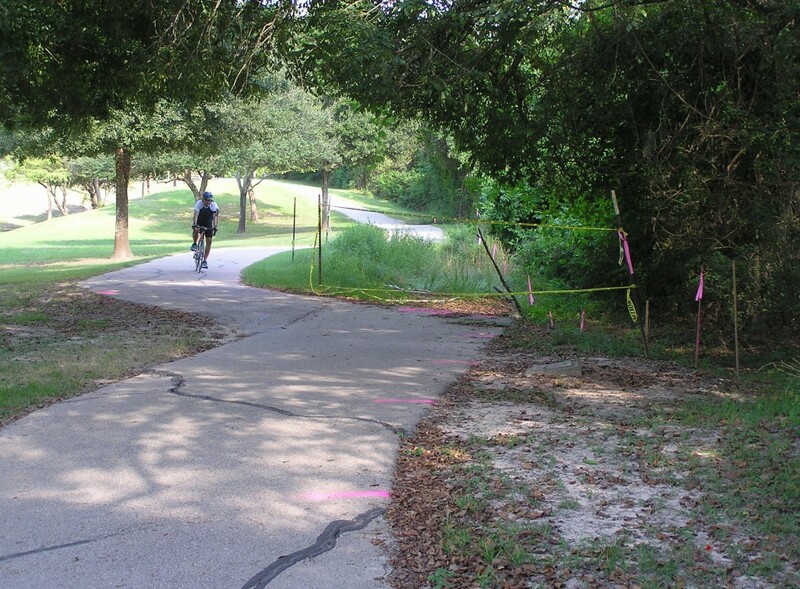 I run these trails weekly and will be interested to see the results of the “repairs” to the paths so close to the bayou. Specifically their durability at the next high water events that take place on this stretch of the bayou. I watched the bayou literally eat into the banks during the huge and consistent release of water from Barker Reservoir after the tax day and subsequent heavy rainfall/floods. I grew up playing along Buffalo Bayou. Back when the 2-lane concrete bridge was built across Buffalo Bayou (about 1950 and now called Dairy Ashford) you could stand and look west along the recently completed re-channeling of the bayou which was straight-arrow to Barker Reservoir. The fresh cut channel looked like a large drainage ditch. No trees lined the channel. This re-channeling was eventually completed to downtown. Many of the natural bends and curves in the bayou were cut and the bayou currents flowed in a straight line. The straightening left some areas on the north side of the bayou on the south side and vice-versa. I believe, but not sure, this rushed the flood waters down stream and caused flooding. I personally believe that a wider area should have originally been set aside and control of the bayou left to mother nature. Thanks, Jim Franklin, for the history, although fortunately the rechanneling was not completed all the way to downtown. In fact, our founding purpose was to prevent the destruction of one of the last natural stretches in Buffalo Bayou as it flows past Memorial Park. You are absolutely right that stripping and straightening a stream causes storm waters to flow more quickly, resulting in flooding and more erosion downstream. And setting aside a wider area for the bayou to overflow into its floodplain should have been the policy and is currently the most advanced thinking in river management. We hope to encourage that sort of policy and enlightened approach in our region. After reading your comments I got on Goggle Earth and found I made several wrong statements. Actually most of the re-channeling was between Dairy Ashford and SH 6, and east from So. Shepard to the downtown area. The subdivisions built at the north and south sides of Buffalo Bayou at the Chimney Road crossing were developed on areas of past bayou alignment that were filled. I live near Terry Hershey and also wonder if the quick drainage provided this waterway keeps my home from flooding. Terry Hershey literally has 1000’s of people enjoying the park on a temperate weekend. What specific data backs up the claim this is wasteful or unnecessary spending? It is hard to understand how the bayou healing itself is the correct path without more information on what, why and how. Thanks for your comment. Your concern is understandable. And we are in favor of keeping Terry Hershey Park a lovely park for thousands of people to enjoy, which is why we deplore the unnecessary destruction of trees, vegetation, and the bayou itself in the park. 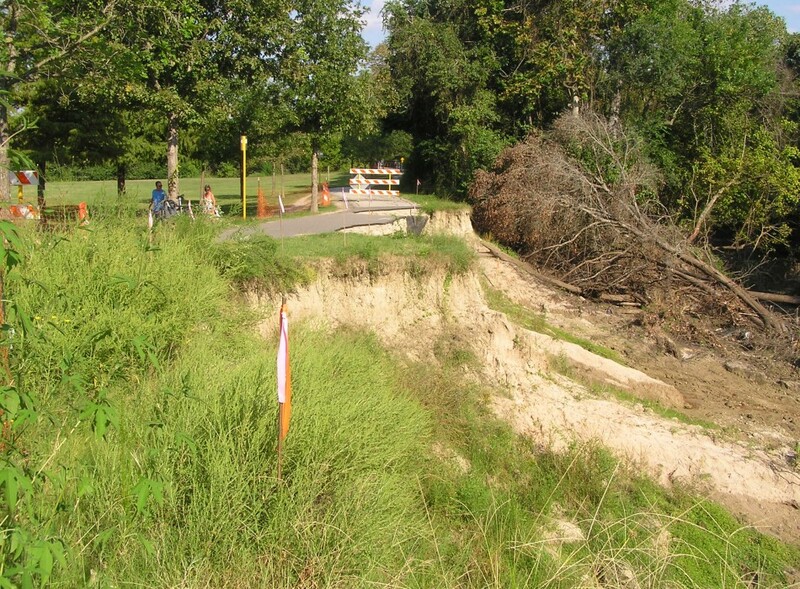 The article details why the Harris County Flood Control District’s bank “repair” project is harmful, one important reason being that it destroys the bayou’s natural ability to cleanse the water. Yes, trees and plants on the bayou and even the microbes in the soil do that. The article also includes a great deal of information about why the method of “repair” chosen by the county is expensive and unnecessary. There are descriptions and links about alternative, cheaper methods and the importance of choosing the least disruptive approach, as well as examples of how even an urban river can restore itself — for free. Quick drainage may (or may not) keep your home from flooding, but it is going to flood someone else downstream. A better, more practical approach is to detain, slow down, and spread out storm water before it even gets into the bayou. The article talks about that, and we will have more on that in a follow up article. The Briar Forest Super Neighborhood in your area has been working to try to persuade the county to build a large regional detention pond in the Clodine area and Residents Against Flooding is a group in the Memorial City area that has filed a suit against the City of Houston and the TIRZ 17 to “fix causes of unnecessary flooding by building detention, improving antiquated drainage systems, and preventing new development from shunting water into our living rooms.” All of these issues impact the high flows in Buffalo Bayou during storms. The article refers to a scholarly book, Floodplain Management, A New Approach for a New Era, that is extremely useful for understanding why working with nature is the best approach to flooding problems. What has been happening with Save The Forest? I haven’t heard anything about them or from them. Have they held any events or tried to educate people about the repairs? Or are they defunct? Thank you, as always, for keeping us all up to date, even if the news is bad. Is there possibility someone will cut the trees across the bayou for better canoeing from Highway 6 to San Felipe? Usually the flood control district does that. Let them know.